Before I continue with the story of Eliza’s husband, Dock Allen and the rest of her children, I thought that a chart might make the story more understandable. Eliza is in the largest photo towards the center of the chart. Her mother is Annie Williams. Both were enslaved by Edmund and Jane Harrison of Lowndes and Montgomery Alabama. Later, I hypothesize, Eliza went with the Harrison’s daughter, Martha when she was married to Milton Saffold. Milton and Martha (she and her children are in the violet boxes) had three sons and then Martha died. Eliza had a daughter, Mary with Milton. 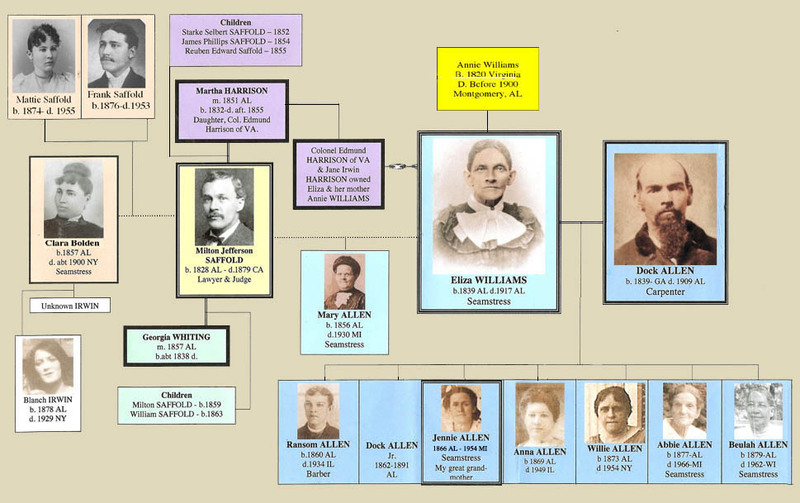 Later Milton married Georgia Whitting (She and her sons are in the green boxes). Oral history says that Eliza and Mary were freed soon after this. Eliza later married Dock Allen, a free man and a carpenter. They had 8 children that survived to adulthood (blue boxes). Around 1874 Milton Saffold had a relationship with Clara Bolten (peach boxes) and they had two children together. Clara had a third daughter with an Irwin. Milton Saffold went to California and died there in 1879. Terrific chart, Kristin! Visual aids always help me make sense of things. Awesome that you have so many photos of Eliza's family. BTW, what did you use to create your chart? I used Microsoft word to make the chart. I used the drawing toolbar to make the lines and add the colors around the photographs. I inserted the photographs after resizing them in Photoshop. To add it to my blog I printed it and then scanned it to a jpeg and voila, here it is. I didn't start out with photographs of everybody but as I found more cousins (and cousins of cousins), I found more photographs. Different branches saved different photos. And had additional stories. Great chart! Thanks for telling us how you created it. I enjoy reading your family stories. It's great to see you have taken to blogging so well. Thanks Sandra! I'm glad I started. It's really making me organize my material. And recheck it. I'm impressed with your chart. What a good idea for showing relationships, especially for clients and relatives who just don't understand written genealogy reports or pedigree charts. I found your work in an unorthodox manner. I was reading some online blogs from 1998, where one person advised another to check out the Saffold Family Society website. From there I was able to fill in some blank spots in my extended family – the Phillips family. I found a listing of this Judge marrying a Harrison girl. Very little information was given about her so I got on Ancestry.com and searched for her. Again, very little info. until I found your note about “Eliza’s story.” Thank you so very much for this thoughtful effort to tell this story. I can appreciate the extra efforts that go into creating these graphics with multiple applications. You create some very fine work. I also do similar graphics in my stories. BTW – the Harrison girl in your story is not related to me – that I’m aware of at this time, but I’m slowly learning her family and mine DID interact in Montgomery, Lowndes and Dallas Counties of Alabama. I can provide you with a bit more information on her family if you want. May I have your permission to reprint your story and graphics? If you desire any specific wording in my providing you credit, please let me know. Thanks again. P.S. – I have other Saffold’s in my family tree.